Who doesn't love candy bark? 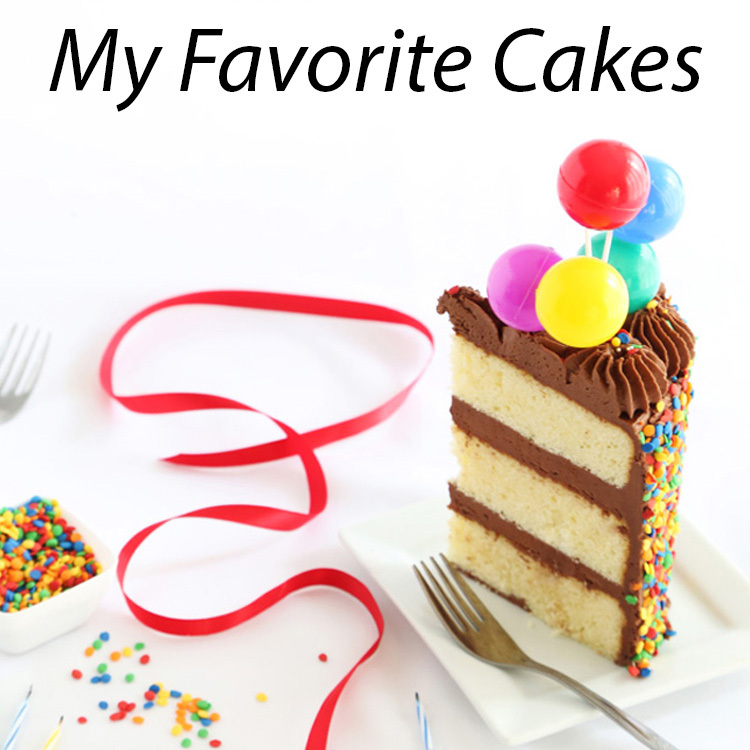 There must be a million different ways to vary the confection and I want to try them ALL. 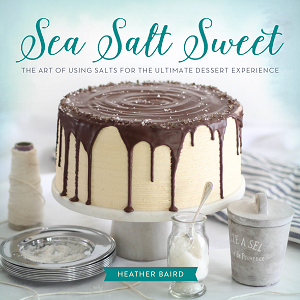 I created this version when Wilton sent me a bag of sugar cookie-flavored candy melts. Boy, are those things good! I ate one or two (or five) right out of the bag. 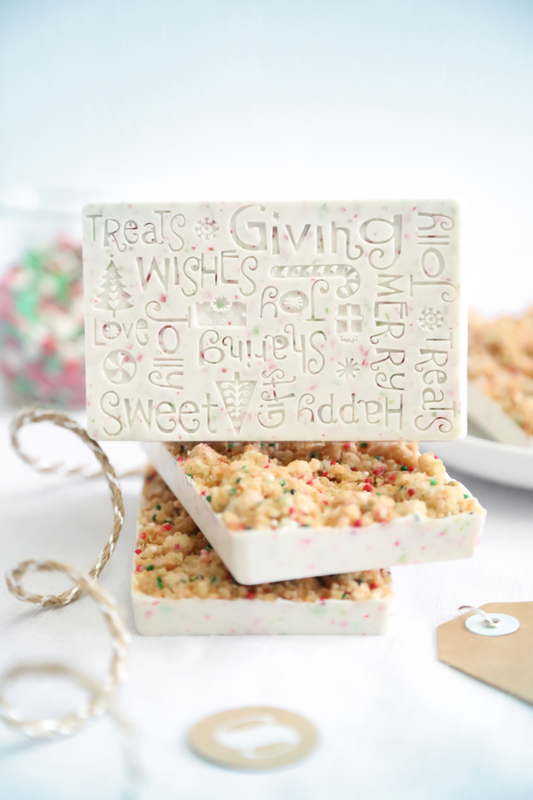 They also sent the cutest candy bark mold imprinted with Christmas greetings. I think I'd rather get candy bark than a Christmas card, wouldn't you? 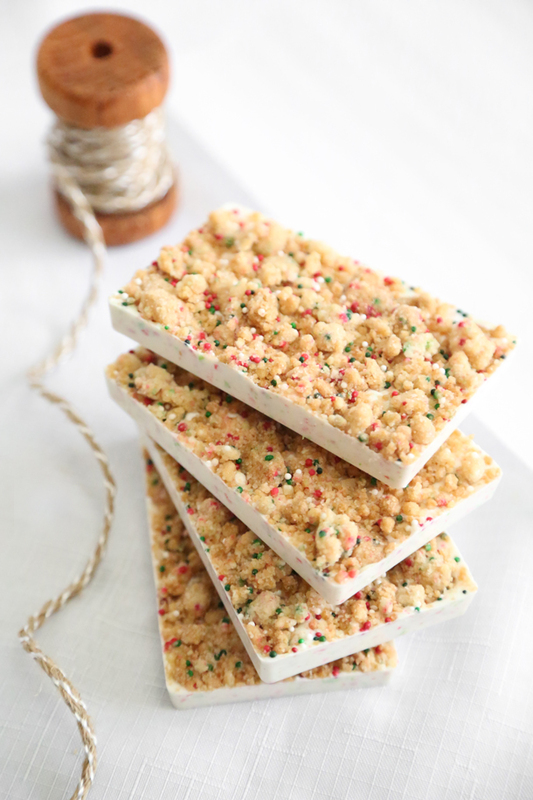 I love making cookie crumbles for cake and muffin toppings, so I knew it would be a delicious addition to this candy bark. It only takes minutes to whip up a batch, and it really adds a delicious homemade element to this candy bark. Sugar cookies of all kinds need sprinkles, if you ask me, so I added Christmasy red and green nonpareils to the mix. For those of you without a moment to spare, you can short-cut this recipe by crumbling bakery-purchased sugar cookies in a bowl and mixing them with red, white and green sprinkles. This was a really easy (seriously easy!) and fun project - delicious too! The bark has just the right amount of creamy cookie-flavored candy to the crunchy cookie crumbles. I'm hooked! 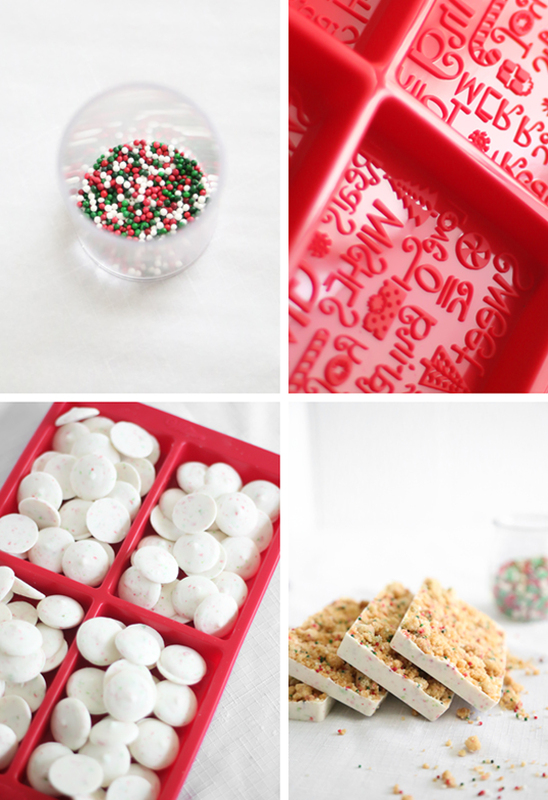 If you're a gifter of edibles around the holidays, then I'd recommend using the silicone candy mold - it makes an adorable presentation. If you'd rather skip the mold, then the candy melts can be spread on a baking sheet and then sprinkled with the cookie crumble. Combine the sugars, flour, baking powder, salt and sprinkles int eh bowl of a standing mixer fitted with the paddle attachment and mix on low speed until well combined. Add the oil and vanilla and mix again until the mixture forms small clusters of crumbs. Spread the mixture onto a baking sheet and bake for 15 minutes. When the crumbs are golden, remove from the oven and let cool completely. If using the sugar cookie mold, fill the cavities with the candy disks and microwave at 30 second intervals until melted - you won't even have to stir the candy melts as you heat them. Just tap the mold on a work surface to even the surface. 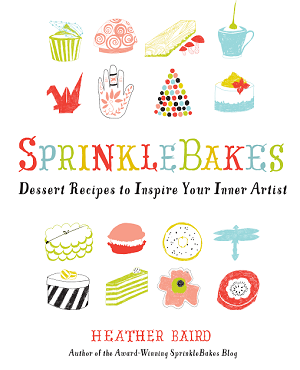 Sprinkle the melted candy generously with the cookie crumble. Let cool completely before unmolding. If you're not using the mold, line a baking sheet with parchment paper. Melt the bag of candy melts in the microwave at 30 second intervals, stirring in between heatings until smooth. 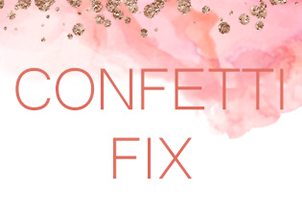 Spread the candy onto the parchment and sprinkle generously with the cookie crumble. Let cool and then break the candy into pieces. Place candy in a cellophane bag tied with pretty ribbon for gifting. Beautiful! I love that mold. Simple, sweet and so cute! LOVE this! I need to find that mold. Perfect treat for neighbors and co-workers. I love this! This bark is just the cutest - such a great gift!! Eeepp these are amazing! Cutest candy bark EVER! These are so cute. 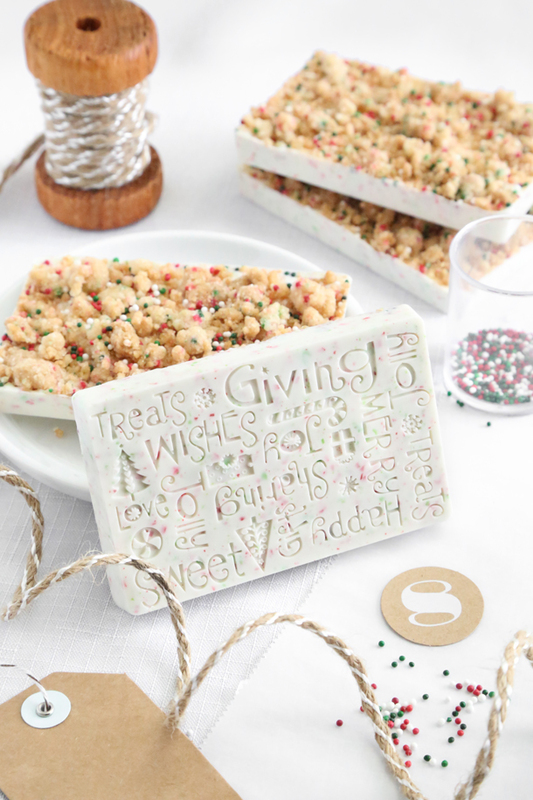 A perfect gift and I would pick sugar cookie bark any day over peppermint bark. 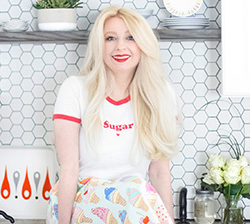 Where did you get those adorable baking trays?! I made some barks with this mold myself and I agree - insanely easy and so freaking cool! Great for Christmas. But these though? Sugar cookie bark? Amazing! I can almost taste it, it looks so good. so does 1 package of melts only make the 4 bars? 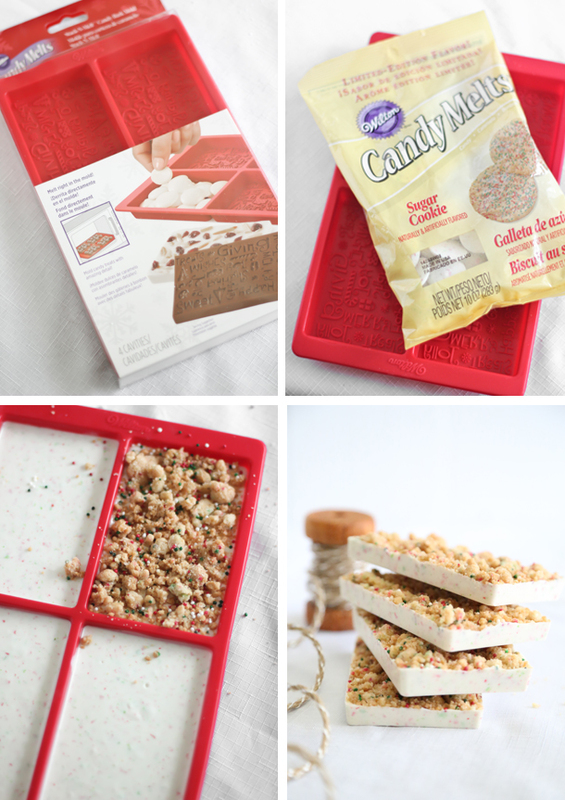 Making these right now - yes, 1 package of melts makes 4 bars. Also, microwave at 50% power. I did full power and the melts burned. :( Luckily I bought two bags!